Grandpa, were you scared in the war? Во врéмя войны́ они́ жи́ли в Ленингрáде. They lived in Leningrad during the war. Дéдушка, тебé бы́ло стрáшно на войнé? Grandpa, were you scared at the war? Чапáев cчитáлся в СССР герóем Граждáнской войны́. In USSR, Chapayev was considered a Civil war hero. Вторáя мировáя войнá унеслá огрóмное коли́чество жи́зней. The Second World War took many lives. Во врéмя войны́ он был солдáтом, а потóм стал офицéром. He was a soldier during the war and then became an officer. Когдá началácь войнá, он пошëл на фронт добровóльцем. 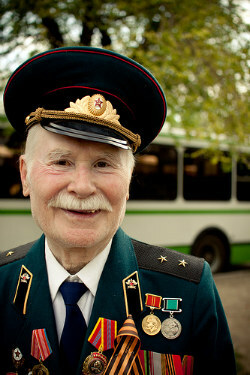 When the war broke out, he went to the front as a volunteer. В 1939 году́ Гермáния объяви́ла войну́ Пóльше. In 1939 Germany declared war on Poland. Эти стрáны ужé давнó веду́т войну́. These countries have been at war for a long time. Конéчно, я отношу́cь к вóйнам отрицáтельно. Of course, I have a negative attitude towards wars. C утрá до вéчера у них дóма настоя́щая война! They quarrel from early mornig till late in the evening! literal From early morning till late in the evening they have a real war! Вы читáли "Войну́ и мир" Толстóго? Have you read the "War and Peace" by Tolstoy? literal At war as at war. Кому́ войнá, a кому́ мать роднáя. There're people who profit from war. literal For some it's the war, and for others it's their own mother.